And those are the three things you need. I’m serious. And a good editor. And a distribution network. But let’s start with the first three. Two main types of light setup: Hot and cold. Basically, the hot use tungsten or halogen filaments like the bulbs you’re used to at home, and the cold lamps use flourescent bulbs, similar to the ones that are now replacing the tungsten bulbs in so many of our light fittings (yes, those twirly, funny shaped things). Since you probably have several of each in your home, you’ll be aware that each produces a different light temperature. Each has its advantages and disadvantages and you should probably read up on the subject before making your decision. Check out the basic lighting notes at B&H Camera for a crash course in the difference between “hot” and “cold” light setups and see some examples. Hot lamps are generally a little cheaper but at 500 watts each, they are called “hot” for a reason. And if you’re filming in Miami where it’s already 90 degrees, three of those lamps will produce 1500 watts of heat very, very quickly. If you touch one, or knock one over, you will burn. And with giddy, naked people running around all over the set you might want to consider the likelihood of an accident. Cold lamps don’t pose this problem, but they are generally weaker and you may need more of them if lighting a large set. And of course if you’re filming in Chicago in December, you might just be grateful for those hot lamps. Lots of choices here. Professional shoulder cameras, versus hand held amater camcorders versus semi-pro cameras; tape versus hard drive; a host of lenses, and of course microphones and tripods. One thing is certain however. HD is here to stay and should be the main theme under consideration in most cases. B&H Photo is a reputable NY dealer with a great website where you’ll see that you don’t need to spend a fortune for 1080 Hi Def. Check out for example, the Sony HXR-MC50U (pictured above). They retail at under $1500. 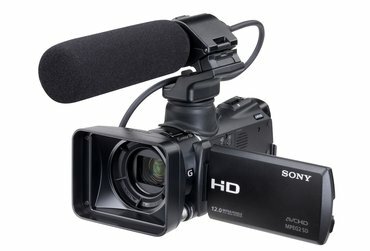 Handheld and highly portable, they are part of the Sony semi-pro range of camcorders and include a shotgun microphone and lens hood as standard. It doesn’t do everything that a pro camera can – but it’s sufficient for certain styles of shooting and makes and excellent B-roll or second camera stand in. That would be the models. We’ll return to this sticky subject in another post! I was wondernig about lights and that was pretty helpful, thanks! Will the Sony HXR-MC50U work with a stabilizer such as the cam caddie scorpion ex pro?